How to Write a Product Review. It covers the 7 elements to include in a product review, and gives live examples you can explore. Potential buyers are particularly interested in hearing about personal experience (and results) with a product, or learning things the sales copy may not have covered. People are searching online every day to read consumer reviews before they make a purchase. A well-written product review, that answers their questions, is a great way to make sales as an affiliate. The question is: how do you get your product review in front of those potential buyers? When someone does a search, they are asking a question - or starting a conversation. Your job is to figure out what they are looking for specifically, and respond to that query with your review. Are they looking for a solution, product comparisons, details on a specific product? This will be obvious by the search phrase they used, and you want to respond to each search query with the right kind of content. For the sake of example, let's say that you're writing a product review of the Plantronics Discovery 975 headset to promote it as an affiliate. Once you've written the review, you'll want to optimize the page for a specific keyword phrase. I prefer to choose longtail keyword phrases for my product reviews, that contain shorter more specific phrases. 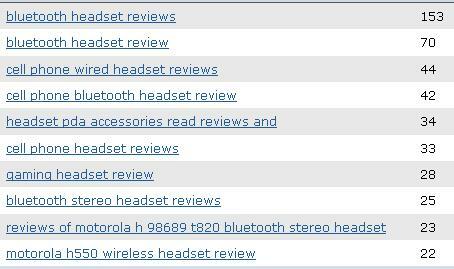 Looking at the results above (image 2), I would optimize my review page for the phrase "plantronics discovery 975 bluetooth headset review". 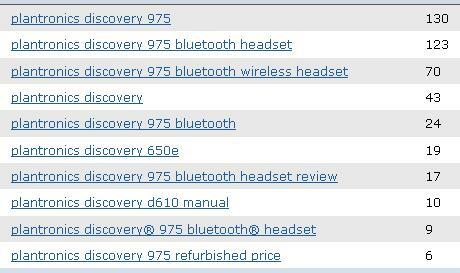 This is a 6-word phrase that only gets ~17 searches a day, but it also includes the exact phrases: "plantronics discovery 975" and "plantronics discovery 975 bluetooth headset". So you now have 3 potential keyword phrases that your one review page can rank well for. To get a page (or blog post) ranking well for more than one keyword phrase, you simply use variation in the anchor text each time you link to that page/post. So you would link to it using each of those 3 keyword phrases as anchor text in various places, instead of always using the same keyword phrase as the anchor text. The more specific phrases (longtail phrases) convert better because the searcher already knows exactly what they want. And multiple top rankings give you more reach - allowing you to reach more potential buyers. Once you have your product review written, optimized and published you will need inbound links pointing to it. These links will get your review page or post indexed in the major search engines, and help it rank well for your keyword phrase(s). The more inbound links you have pointing to your page, with the keyword phrase as the anchor text in that hyperlink, the better your page will rank for that phrase. Getting high quality, relevant inbound links to product review or commercial pages can prove to be a difficult task. It's much easier to get links to funny videos or how-to pages, as people tend to share those naturally. For your product reviews, you'll want to do some strategic content marketing. Start by going back to your list of keyword phrases. Choose phrases that are relevant to your product review, and create content for each of those topics. Basically you want to create a list of all your extra keyword phrases. In most cases you'll find a lot of informational keyword phrases, where people are searching for how-to information on the topic instead of specific product information. A good example in the list above would be the phrase "how to pick a headset". You could write an article that helps the reader walk through the choices based on their needs - are they gaming, listening to music, need bluetooth or wireless, doing interviews, etc. Walk them through the process of choosing a headset for their specific needs. Somewhere in the context of the article you'll have an opportunity to link to your product review using one of your chosen keyword phrases. Where do you publish all of this content? If you have a lot of keyword phrases to work with, and it's relevant to your site/blog, you can choose a few pieces to publish on the same domain as your review. Internal links (links coming from pages on the same domain name) do count as inbound links. The goal is to create related content that links back to your review. 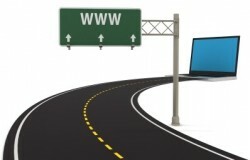 Other places you can publish this content include: article directories, squidoo, hubpages, and blogger or wordpress.com. Article Marketing is the same as blogging - or guest blogging even - in that you find keyword phrases your market is using and you write content for them. Where you publish it is what makes the difference between a guest blog post, a blog post or an article. Don't get confused over the lingo or the method or the platform. In the end it's all just keywords, content & rankings. I'm not one to "spin content" for the sake of blasting it all over the web just to get links. That's just junking up the web, if you ask me. When you write content that targets a keyword phrase, you are "entering a conversation". The searcher asks a question, your content is the response to that question. Address their thoughts and needs, and then lead into the next best click - meaning you interest them in reading your product review next. Content will serve you best if you write it this way, with the human reader in mind. Then, not only will it serve as a quality inbound link to your product review, but it will also funnel highly targeted traffic (ie readers) to your review page as well. Obviously you'll do best by having each piece of related content rank well in the major search engines for it's own search term, in addition to your product review page. That just gives you more market reach through multiple search queries. Thanks for sharing that information Lynn, I hadn't realized the importance of long tail keywords. I am now going back in to amend some of my articles. Thanks for your help from a sunny & chilly UK! structure some of my blog post and articles. I have not done a product review on my blog as of yet. So I will make sure to follow your advice when I do. Also, have you thought of doing a follow up on the Case Study: Monetizing a Blog from last month. I would really be interested what those ladies did to their blog and how it is working for them. Another great post Lynn. I would add that forums are a great place to hang out and see what questions your potential customers are asking. This long tail stuff is pretty easy to rank for and shows high conversion. People shouldn't be put off my the relatively low search volumes as things soon add up. It's easier to rank 10 reviews for long tail phrases than it is to rank one review for a more competitive term. Won't make you rich over night but will allow you to consitently build traffic and sales. A great post. Getting plenty of visitors to their product reviews is something that many struggle with. You lay it out very clearly. I'm pleased that you don't like "spinning" articles. It amazes me how so many people believe that if you change a few words around you have something original. You don't. You have rubbish! how can i drive traffic to my product review? the product is benzo fury, and it is part of my chemical research. the problem is getting people to the review page? That's something new. When you've just started your adventure with SEO you keep thinking about things you've overlooked. Thanks for this advice. I definitely agree with this guide Lyn! I've also published a recent blog post that is quite related to this strategy. Since the best way to optimize longtail keywords are through contents that are strictly about the "targeted keyword" to make the link 100% relevant with the destination page. It's also important to choose good pages where your posts/articles will be submitted (preferably authoritative article submission sites and/or guest blogs on related sites with high traffic rank and pagerank). Great article - I am just beginning to get started to include an element of product reviews as part of my overall website strategy. You have a beautiful blog and that picture at the top doesn't hurt it either. Nice article. I especially like the point you made about writing for people and not just for links. I have run an article directory in the past and found that if you write for people, as you stated, your articles will be syndicated at a much higher frequency than a self serving one. The most difficult thing in writing about products in keeping in mind that we should do it for people not for PR or Google. Some descriptions look as if they were written exclusively for gaining backlinks. I've just started reviewing products and this tips will be a great help in doing effective affiliate products review. I'm looking forward, with the lessons I learned here and applied thoroughly, I will earn affiliate income before the year ends. I'm glad you shared this great tips. Playing the devil's advocate here; one of the most irritating things for me is looking for a review from someone that has actually used a product. It can be frustrating to say the least. As an example, off the top of my head, let's say you want to buy your grandmother a new electric blanket. You want to find out what experiences others have had with a particular brand that has been advertised on TV enough for old grams to want it. What comes up on the 1st page of Google? A bucket load of affiliates that want to make a sale (don't we all) and not one of them have actually used the product themselves. It is obvious from the copy. Some are much better writers than others, and then there are the others where it is apparent that the reviews have been ghost written for the site. So, for all you affiliates that are going to be writing reviews, IMHO, careful how you write your reviews. You may do well for the search engines, yet not do well for site stickiness or sales.